Today's Image of Mars comes from HiRISE and shows folded layered deposits in Melas Chasma, which is located in central Valles Marineris. That's right, there are huge layers of rock that have been folded over on one another! The question is, how did they get that way? We can use the knowledge gained from examination of similar features on Earth to make educated judgements about their creation on Mars. On earth huge rocks will fold when they become deeply buried and are exposed to high pressure and temperatures, but on Mars this is unlikely the case because it doesn't experience as much vertical shift as Earth does. 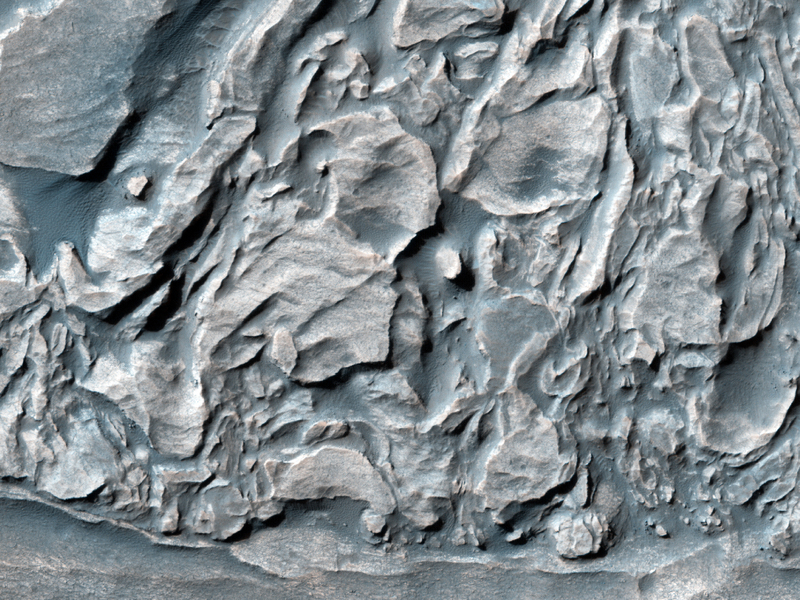 There is a more plausible explanation for these folded features on Mars, and that is water. Water could have caused the material near the surface to be become soft and malleable, making it easier to fold and bend, even under the slightest pressure.